A much-loved grandmother leaves behind a precious legacy. My own one passed away a few years ago, but every so often I honour her memory by rehearsing stories in my head. I run through some of her own anecdotes as well as odd recollections from when I was growing up, like her sitting on the terrace in her Ibiza home, chatting to my uni friends about Brad Pitt, with her legs hanging over the arm of a chair. Such rituals keep her close. "We sense the dead have a vital force still," said novelist Hilary Mantel yesterday, as she delivered a Reith Lecture on Radio 4. "They have something we need to understand. Using fiction and drama, we try to gain that understanding." My grandmother's life in repertory theatre during the second-world war became a jumping-off point for my first Kindle novel, A Sister for Margot. Last week, I attended the launch of The Woolgrower's Companion, another novel inspired by a grandmother and her stories. This epic tale of a young woman battling to save her family farm in the outback has become Australia's fastest-selling fictional debut this year. 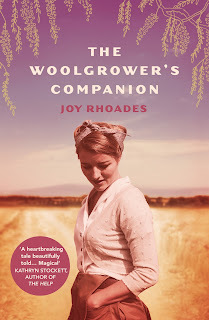 Author, Joy Rhoades, acknowledges that her grandmother's experiences as a fifth-generation grazier in New South Wales was a driving force behind the creation of her novel. At the London launch in Australia House, Joy described her grandmother, Gladys, as "the repository for family stories". Although the novel is not about her grandmother's life in the strictest sense, it has grown out of her stories about life on the land, Italian prisoners of war and the harsh social codes of the time. "I wanted to capture a world that was very hierarchical and very constrained," Joy told us at the book launch. Her grandmother was a lady who gardened in high heels and boarded airplanes dressed in white gloves, but she also lived on a farm in the bush. "That spirit of strength and steel, I really wanted to capture." The result is a novel about resilience, character and the blossoming of love in the unlikeliest of places. Its heroine, Kate, is forced to outwit the local bank manager in her efforts to save the farm from financial ruin. Amid this struggle, the arrival of an Italian prisoner of war, assigned to work on the farm, shakes up Kate's world in more ways than one. In the words of Clara Farmer, publishing director at Chatto & Windus, "this book is the most wonderful place for a reader to escape to... the white mist, the bowerbirds and a POW with particularly beautiful, green eyes." Sadly, Joy's grandmother died before The Woolgrower's Companion was finished, but Joy was pleased when her aunt - Gladys' daughter - endorsed the book. "Dear, you nailed it," she told her niece.